Word for Today: Are you born of the Holy Spirit? Are you born of the Holy Spirit? 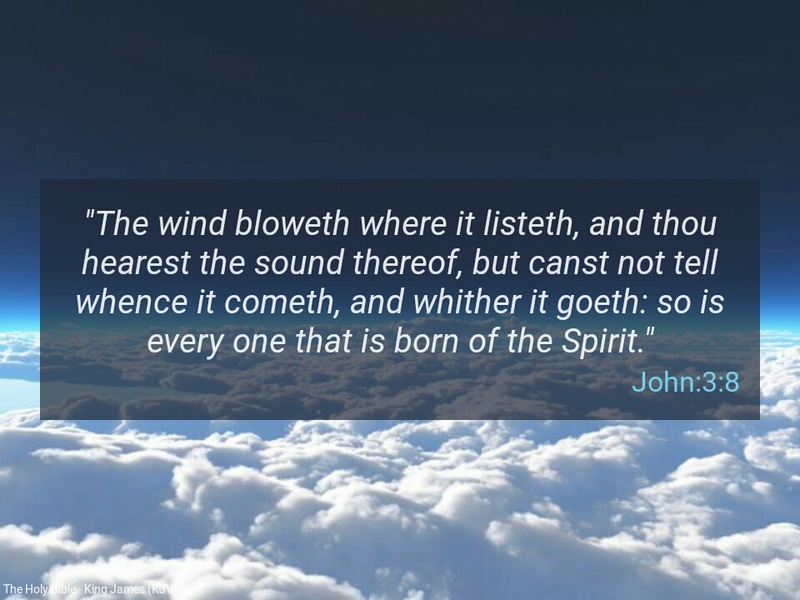 “The wind bloweth where it listeth, and thou hearest the sound thereof, but canst not tell whence it cometh, and whither it goeth: so is every one that is born of the Spirit” ( John 3:8). “Jesus answered and said unto him, Verily, verily, I say unto thee, Except a man be born again, he cannot see the kingdom of God” ( John 3:3). A clear implication here is that one can be truly born again( he or she will SEE the kingdom of God), without being born of the Holy Spirit. Verse 5 clarifies that without being born of the Holy Spirit, no one can ENTER the kingdom of God. There is big difference between seeing something and entering . Remember the rich man’s story in Luke 16:19-25. He could see father Abraham and poor Lazarus in glory, but meanwhile, he was languishing. This story is real. I am not trying to frighten anyone. Be born of the Holy Spirit . “For as many as are led by the Spirit of God, they are the sons of God” (Romans 8:14). It’s either you are a son of God or you are not. No wonder, there are so many fearful ‘Christians’ in the church. The truth is that many Christians are not sensitive or conscious of the Holy Spirit dwelling in them. They are not following the leading of the Holy Spirit. The Holy Spirit is real. The Holy Spirit is exciting, aggressive and intoxicating. He is a Spirit of compassion and love. He is the Spirit of truth and righteousness. Do not relate with Him only by speaking in tongue. Allow Him to lead, guide and direct your life. “The Spirit itself beareth witness with our spirit, that we are the children of God” ( Romans 8:16). If the Spirit of Jesus Christ dwells in you richly, then you are a transformed spirit being. Dear Father, please help us to be born of the Holy Spirit and to yield to the guidance of the Spirit in the mighty name of Jesus Christ. Amen. Previous Previous post: Word for Today: Have you received the Holy Spirit? Next Next post: Word for Today: There is power in expectation.